Have you always admired the giant sheepdog van from Dumb and Dumber, but felt as if the Mutt Cutts Shaggin’ Waggin could be improved somehow? By, perhaps, chopping off the roof and adding a loud sound system? Dream no longer. It’s real, it’s spectacular, and it’s for sale. 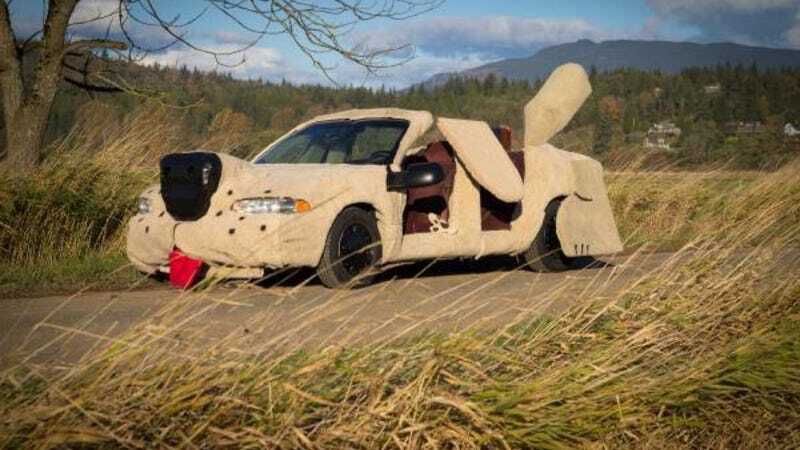 This is a 1998 Buick Century as sheepdog that is now for sale on Craigslist in Bellingham, Wash. Look, and behold. Wag thy tail in its glory. Let’s be honest, the Buick Century was a bit of a dog in the looks department to begin with. By chopping off the roof and covering this 1998 example of Buick’s lumbering grandma-mobile in beige fur, these dudes have done the world a service. Not only have they fitted the open-top Century with flapping legs, Duramax extendable mirrors and a tail, but they’ve also added a loud sound system. They’ll take it out if you’d like to pick up the car for $1000 less, but personally, I feel as if a giant subwoofer adds to the car’s charm and appeal. You’ll be able to annoy chihuahuas in the next county, that’s for sure. The ad swears this car is great for events like Burning Man, which is certainly a better climate for a perilously exposed sound system than Western Washington. To me, it also screams “24 Hours of LeMons judgemobile,” provided they’re not racing in a miserably wet climate like The Ridge or MSR-Houston. Perhaps you’re not interested in taking it to the playa. Perhaps you actually own a mutt cutting business of sorts. Rejoice! The sellers say that they’re willing to throw in the dog costume. Are you sick and tired of eking your way through life? Are you sick and tired of being a nobody? Well listen up here all you pumpkin pie hair cutted freaks! The one and only mutt cutts chop top can now be yours for the takin! Take your pooch grooming business to the next level with this 84 sheep dog. Shoot your boss my be so impressed with your new whip he might give you that christmas bonus early you can finally start up your own pet store selling worm farms. Looking for a ride down to the desert with seabass and the boys for burning man? Look no further! Load up the boilermakers and hop in the wagon and you are guaranteed the best summer capper dancing the night away in this pup with thousands of other burners. Having horrible luck with the ladies after spilling the salt last month eating dinner? No problemo, beautiful woman instinctively flock like salmon of Capistrano around this shaggin waggon! Does your best friend Billy from 4C always call you a pathetic looser? Pull up in your brand new chop top and tell him he’d better keep his mouth shut if he knew what was good for him! He’ll probably be so stoked on the new car that he’d take you out for dinner and buy you some foot longs on the house and throw in his parakeet petey to burry the hatchet. Don’t miss your chance on picking up your very own mutts cutts. Your chances might be one in a million but hey theres still a chance to don’t hesitate to give me a shout! I will also throw in the matching mutt cutts dog suit. Full zip up pup jumper with the puppy gloves and basset hound head cap. Car was recently featured in king5 evening and also in a video contest for the second dumb and dumber movie. It won’t be easy letting this love memento go but its time to pass the torch to another owner. I’m hoping to continue the legacy with a new project which this will hopefully fund. I own an enclosed car trailer so if the price is right I will deliver just about anywhere! Car is fully legal and ready to embark on its new life turning frowns upside down and starting spontaneous dance parties! For $2000, glory, Sea-Tac-area-fame, and an escape from looserdom [sic] can be yours — and it doesn’t even need a feul [sic] pump! Craigslist here, or go here if the ad disappears. All images belong to the original listing.